Know the facts before you tow with your vehicle. Unless you use your vehicle to tow everyday for work, odds are you haven’t paid much attention to your truck, SUV or crossover’s towing capacity. Maybe you’re looking to buy a boat for some summer fun or just need to rent a trailer to get your belongings from one dwelling to the next. Whatever the reason for pulling something behind your vehicle, it’s important to get a firm grasp on what exactly your towing capacity means. Understanding how each of the components in your vehicle contributes to your overall tow rating can keep you from putting undue stress on your rig and keep you and your family safe. 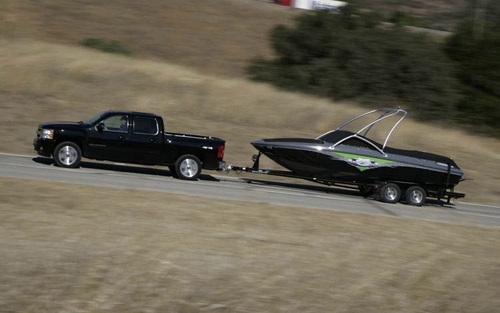 Simply put, your towing capacity is the amount of weight your vehicle can pull. Keep in mind that doesn’t just mean what’s attached to the hitch out back. What most manufacturers neglect to tell you is that your towing capacity is really a combination of everything inside of your vehicle, including occupants, cargo and fuel, as well as the combined weight of your trailer and whatever is in/on it. In some cases, it may be more helpful to take a look at your tow rig’s gross combined weight rating, or GCWR. It accounts for all of the factors listed above in one easy-to-read figure. So how exactly is your towing capacity calculated? 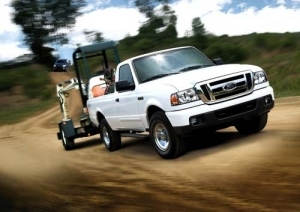 Engineers take into account five main areas of a vehicle when discerning towing capacity. Your vehicle’s beating heart can only do so much work. To that end, how much horsepower and torque your engine produces is one of the biggest factors in how much you can tow. Generally, big V-8s produce plenty of torque. The trade-off is that those motors also tend to get worse gas mileage than their smaller counterparts. If you’re looking to buy a vehicle for towing, be realistic with yourself. If you only plan on pulling a 1,500-lb pop-up camper, there’s no need for a 10,000-lb towing capacity and an engine that drinks more than necessary. As important as your engine is to your towing capacity, what kind of transmission you have plays a pivotal role, too. While manual transmissions are often thought of as the best choice for hauling big loads, modern automatics can be just as capable as their cousins. The type of gearing inside as well as how stout the internal gears are will play the biggest role in what you’ll be able to tow with your vehicle. If you are planning on doing any serious pulling for long periods of times or up steep inclines, a transmission cooler and temperature gauge are great investments. No matter what you are towing, each part of your drivetrain is under added stress, including your axles. In rear-wheel drive vehicles, your rear differential will decide your vehicle’s final gear ratio, further enhancing or inhibiting your towing capacity depending on the figure. The tougher your rear differential and the stouter your axles, the more you’ll be able to tow in the end. Getting your vehicle moving is only half of the equation. At some point, you’re going to need to slow down, and if your vehicle’s brakes are too small, you may not be able to handle the additional burden of a big trailer and extra weight. While it is theoretically possible to upgrade your vehicle’s brake system, doing so is cost-prohibitive. If this is the weak spot in your towing formula, you may simply need to look into getting a tougher vehicle. 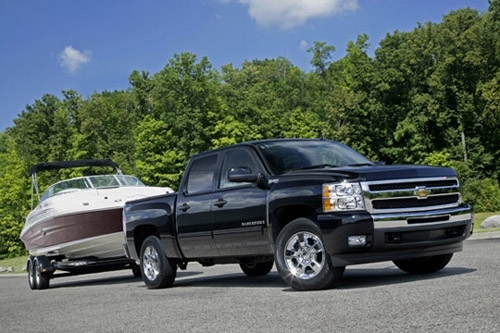 The last major ingredient in the towing capacity recipe is your vehicle’s frame. It handles all of the stresses of pulling and stopping the trailer behind you, so tough, body-on-frame-designed vehicles are typically better at handling towing abuse than unibody examples. The length of your SUV or crossover’s wheelbase will also play a factor in how much you’re able to pull behind you, as short wheelbase cars and trucks are harder to control with a trailer behind them than their long-wheelbase cousins. Now that you have a good idea of what makes up your vehicle’s towing capacity, don’t push your luck and exceed it. Doing so will only shorten your vehicle’s life span and put you and those around you on the road in danger. Respect your vehicle’s limits and your towing experience can be easy and drama-free.